Ebstein's Anomaly involves a deformation of the tricuspid valve, with abnormal valve leaflets and a position in the heart that allows the right atrium to extend well into the space of the right ventricle (known as atrialization of the right ventricle). The right atrium and right ventricle often become enlarged (dilatated) in this defect and the right ventricle may develop thickened muscular walls (hypertrophy). In addition, an atrial septal defect (ASD) is often present and may be patched during repair. 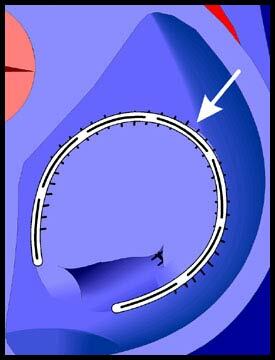 The repair operation also involves some suturing of the wall of the right atrium and/or the replacement of the tricuspid valve. All of these factors encourage the development of atrial arrhythmias, such as atrial fibrillation and/or flutter, which will occur in one half of adult Ebstein's patients. Accessory conduction pathways are often found in the Ebstein's patient. These are abnormal routes for the electrical impulses that may lead to atrial arrhythmias, such as Wolff-Parkinson White syndrome. A single Ebstein's patient may experience more than one kind of arrhythmia. However, heart block (the slowing or stoppage of the movement of impulses from the sinoatrial node, the heart's natural pacemaker) is not usually caused by this defect and arrhythmias in which the heart's rhythm is slowed down (bradyarrhythmia) are uncommon. Treatment of arrthymias in the Ebstein's patient may involve medications and/or the implantation of pacemakers or ICDs (implantable cardioverter defibrillators that detect arrhythmias and shock the heart in order to restore normal rhythm). Radiofrequency ablations (non-surgical procedures in which the heart tissue that is causing the arrhythmia is neutralized) are performed, though with somewhat less success than with the average patient (75% successful as opposed to 95%), and with more risk of recurrence. An operation known as a "right-sided maze procedure," in which a series of incisions are made in the wall of the right atrium to interrupt conduction pathways, has proven effective in treating Ebstein's patients with atrial arrhythmias.